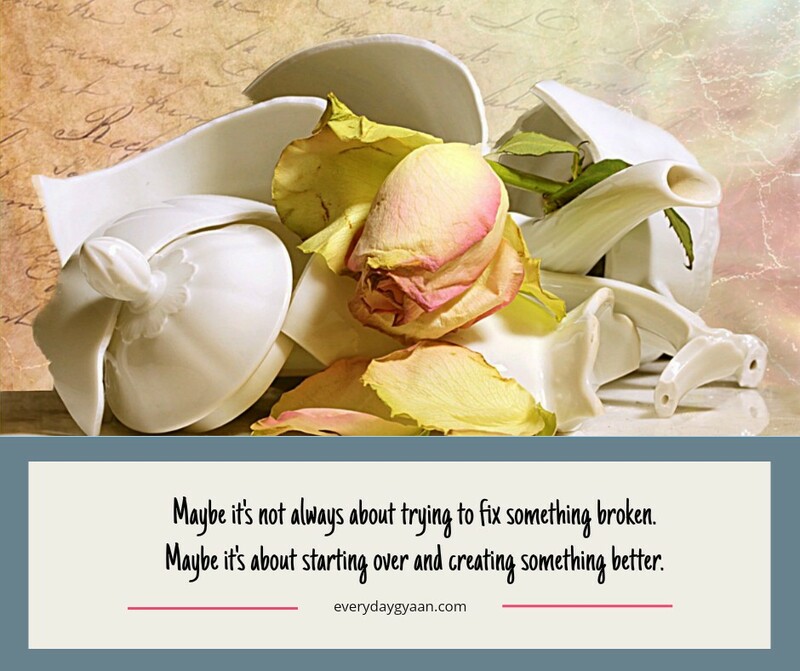 One thing stands true though, after any kind of loss, we “start over” to one degree or another. The relationship is seen in reflection, and sometimes even more clearly. Those things we cherished about the people we lose, well, those sting for a long time after as we come to terms with the fact we will not have that from them again. There is a unique opportunity……as we see those things that made the person we lost so special to us…we have an opportunity to be that for people we still have in our lives. While Lisa was most probably referring to the death of a loved one, I began to think about the other losses we have, especially the loss of friendship. In recent years, for one reason or the other, I have lost friends. Some of these people were an integral part of my youth and adulthood, but are no longer friends. I am much happier and freer without these people in my life – and I say that with no bitterness, but just that it’s the simple truth. There was anger, pain and feelings of betrayal (on both sides, I’m sure). For some time, it was difficult to think of these individuals without the emotions I mentioned. I am able to look back and remember happier times in these relationships. When I read what Lisa wrote, it struck me that I could also think of some of the qualities that I admired in these people. Although they are no longer a part of my life, I can replace feelings of bitterness with memories of their good qualities. I could go a step further and try to incorporate these qualities in to my life. Wouldn’t that be the perfect healing for these relationships? I agree….I feel like sometimes the healthiest thing we can do for ourselves is to put some people in the rearview. Cut ties and not try to force things. Take the things you loved about them and put them to use in your life, and recognize that life is constantly moving and changing, and moving on from people can launch you into a new level of your life! Thank you for this! I can very much relate. It’s about focus I think and what you want to spend your heart’s energy on. I know I am more at peace and maybe that’s selfish but I am moving forward with the loss and that’s all I can do. Thank you Corinne for some steps to let go mentally of the people who are no longer physically present in our lives. If we don’t let go, we continue to sabotage ourselves with bitterness and anger at the people who hurt us so replacing it with positivity and appreciation of their qualities is a great tip. I love this! I have a handful of friends in recent years. Most as a result of “friendshifts” as Bellybytes mentioned, and a few because of nastiness that I’ve since let go. The friendshifts part is harder, I think. I’m single and childless, but all of my closest friends are quite the opposite. After a while, it gets very difficult to find things to talk about, other than shared memories of the past. So in the end, there’s a slow but necessary letting go. This is a lovely, peaceful post. Thank you. It’s hard to let go, even when I realise that I need to. I think part of it is the uncertainty of what will come after, especially when it’s a close friend that I shared many experiences with in the past. The toughest lesson for me was the realisation that “after” will be better for both of us. We’ll both go on to form new, enriching connections and our lives are better for it. I still struggle with this though. I had a “friend” from childhood who wasn’t really a true friend. As an only child, she’d been spoiled and felt that her needs came first in any relationship, and she would gossip about others which made me realize that she probably did it about me. Sometime during Middle or High School, we parted ways and there was no guilt about it. I was able to start over with new friends, that I still have today. Recently, however, I reconnected with this old friend at a high school reunion and while she hasn’t changed one bit, I realize that I have and I’m more equipped to handle it. While I still limit our contact, that hasn’t stopped me from enjoying a few nights out with her and other old classmates. What a beautiful thought. Tomorrow would have been the birthday of my best friend from childhood. We knew each other for 53 years. Now, her husband is traveling through Europe during the week that would have marked both her birthday and their 44th wedding anniversary. We all have to forge new paths for ourselves from time to time. One day, I know I will have to do that again, too. I agree with Carol — to every thing there is a season. Relationships, though necessary, are hard! Even the good ones. I think you are absolutely right in thinking sometimes friendships cannot be repaired, and in those cases, we should move on and begin again in a new space. Thanks, Stephanie. Creating new space is so important. Beautiful post Corinne. I agree one needs to let go, de-clutter one’s life at times and start afresh. It may feel like a drastic step to many, but it may be a better move to make than be bogged down by the relation. Kala, I learnt the hard way that friendship is not always for keeps, but we can remember and be grateful for what we enjoyed when we were friends. At one time I used to mourn the loss of a friendship but reading a book called “friendshifts” made me realise that friendships like many relationships are evolving and the loss of a friend need not be a sad thing …. Your memories still exist though the intensity of your relationship has changed. But I definitely don’t like losing friends and genuinely feel sad when friends stop talking to me for reasons I can’t fathom. Amazing post! Struck a chord with me! People getting stuck and not being able to move on is a huge thing happening these days! Starting Over is the best thing you can do! I’m glad that resonated with you, Danny. Yes, it’s seems that we’re now not willing to let go, thinking that it shows strength of purpose and determination. Hence all the acid throwing and pent up anger at plans and dreams gone awry. Moving away from friends that cause distress is stressful and painful. Debbie D’s comment about ‘stalker’ rings a bell. If there was one lesson I learnt from the whole experience, it was that friendship, like love, should be bestowed wisely. As always there’s a lesson to be learnt even in the most trying of situations. Removing toxic people from your life can only improve it, I think. Good idea to remember the good times and not dwell on the bad ones. Only once did I terminate a friendship. The woman was a compulsive liar and somewhat of a stalker. I don’t miss her at all. 🙂 It might be more difficult with blood relatives, especially if you have to see them at family gatherings, but life is short and it’s better to be happy, yes? Many times people enter our lives for only a season. Sometimes, when they move past the relationship they have with us, it hurts. Sometimes we are glad! But I believe that each relationship can make an impact and we can find something positive to take away with us. True, Carol. We must look past the hurt to see the learning.